NEKTON-Q is an extremely valuable vitamin supplement composed of highly active and nutritive substances. Its composition and blend take the special needs of birds in quarantine or under medical treatment into full consideration. Although most of the time every care is taken to make an animal as comfortable as possible during quarantine, this period of acclimation places excessive pressure on an animal's organs, as is also the case when a bird is ill. At times like these it is absolutely essential that a bird's diet is supplemented with particularly suitable vitamins. The many years of manifold experience in our own recognized and authorized quarantine station proved invaluable in the research and development that went into NEKTON-Q. The results showed us that a particularly high proportion of vitamin A is necessary to increase the number of antibodies in the bird's organism and thus improve its resistance to infections. Vitamin A also has a positive effect on the bird's epithelium, which is frequently under strain during medical treatment. However as vitamin A acts as an antagonist to the body's absorption of vitamin E, NEKTON-Q contains a correspondingly higher share of vitamin E, a vitamin that plays an important role in the organism's immune system. One of the perhaps most important factors in NEKTON-Q's great effectiveness is the amount of highly potent vitamin K3 it contains. Menadione, or vitamin K3 as it is commonly known, is extraordinarily important for proper coagulation of the blood. It is general knowledge that treatment with antibiotics and sulfonamides can result in poor coagulation of the blood. This is because this kind of treatment hinders a synthesis of vitamin K by the intestinal bacteria, and a vitamin K deficiency means a longer coagulation time. This can happen very quickly in the case of a sick bird, as a bird's system for forming vitamin K is much more primitive than that of a mammal. We frequently read reports in veterinary journals that bleeding often occurs in various tissues and organs such as the hypodermis, muscles, intestines, duodenum, peritoneum and brain during treatment by injection. NEKTON-Q can help reduce such phenomena as well as bring a bird through this period of general stress better. NEKTON-Q has been formulated to ensure that a bird receives an adequate supply of the vitamins its organism is unable to produce enough of because of the doses of antibiotics and sulfonamides. Apart from the vitamins mentioned above, a bird needs vitamin B2, B6, biotin (vitamin H) and folic acid. The folic acid in NEKTON-Q has the important task of stabilizing the blood count, but naturally all the other substances in NEKTON-Q have been calculated in such a way as to prevent a negative influence of antibiotics and sulfonamides on the blood count. What makes the NEKTON-Q formula so valuable and effective, however, is not only which vitamins, amino acids, minerals and trace elements it contains but how they are blended. The correct effect can only be obtained when the individual substances are in the correct relation to each other. A high proportion of vitamin C is necessary, for example, because of its inestimable value for a bird's organism in times of stress. 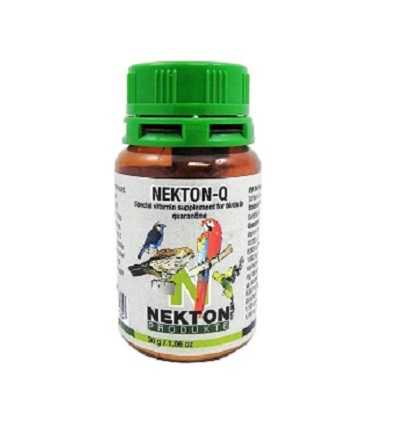 NEKTON-Q is a vitamin supplement mainly used by bird importers, dealers and breeders and veterinary surgeons for birds in quarantine or sick birds. Why don't you follow their example and take advantage of NEKTON-Q's qualities, too? Just add to the drinking water. NEKTON-Q in powder form is so easy to use. As a guide we recommend 1 g NEKTON-Q to ¼ l water i.e., ¼ teaspoon to ½ pint water. The enclosed measuring spoon holds 1 g = ¼ teaspoon. Use a fresh NEKTON-Q solution every day. Please note Because of this supplement’s higher content of vitamin D and trace elements than in a complete feed, it may only be added to 10% of a bird’s daily ration.